OnAccess 1002 PCI-E Optical Ethernet adapter is designed to operate at 100Mbps and to provide a network throughput of 200Mbps in full-duplex mode. It complies with the 100Base-FX Ethernet standard and is configured with 1x9 optical transceiver module. It offers a range of options, such as fiber / connector type and operating wavelength / distance, to meet the requirement of various applications. 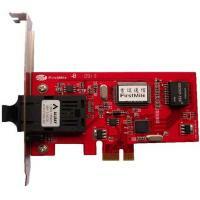 Complies with the IEEE 802.3u 100Base-FX Ethernet standard. Complies with ACPI 2.0 specification.